Still mostly empty Friday morning, the junior fair barns began to bustle in the afternoon with life as stalls were being set up and livestock brought in for the 2017 Delaware County Fair. Ward has helped set up the junior fair the last 17 years. While Sarah and Emily Barth were still in school their father, Kevin, was setting up a stall in the beef barn. He said he was trying to get the heavy lifting out of the way before the girls arrived there after school. Bryce Smith decided even though it was an unexcused absence it was worth cutting school to set up the stall for his horse, Merada. He said in the past he has shown both hogs and horses, but this year he was only showing Merada, whom he’s owned for almost a year. Smith said once he has taken care of Merada, he’ll enjoy the fair by walking around with his friends. “It’s a lot of upkeep with the animals,” he said. Joey Roberts’ mom, Erika McCauslin didn’t give her son the same break as Smith. He was in school at Schultz Elementary in Delaware. But, according to McCauslin, he does get Monday off from school to show his hog, Rocket. McCauslin said she grew up in Knox County, showing market hogs for 10 years at the junior fair. She said although she showed animals for a decade, she doesn’t place any expectations on her son. Last year, he won the showmanship competition. “I just want him to go out there and do his best,” she said. When it comes to showing his 250-pound hog, Elvis Pigsley, Clay Whitaker, 12, said he can handle him “like a pro.” Whitaker said he himself weighs in at about 125 pounds. Whitaker attends Buckeye Valley Middle School and this will be his fourth year to show market hogs. During the fair Whitaker plans to enjoy the fair. “I’ll hang out with some of my friends, ride the rides, and visit my favorite stands,” he said. Eli Van Gundy said he has been in 4-H for the last seven years showing dairy feeders, but like his sister, he has shown hogs before. The Delaware County Fair opens Saturday and runs through Sept. 23. Once junior fair participants got out of school on Friday, the barns began to come to life as livestock filled the empty stalls of the Delaware County Fair. Some showmen decided it was worth skipping school to start setting up the early. 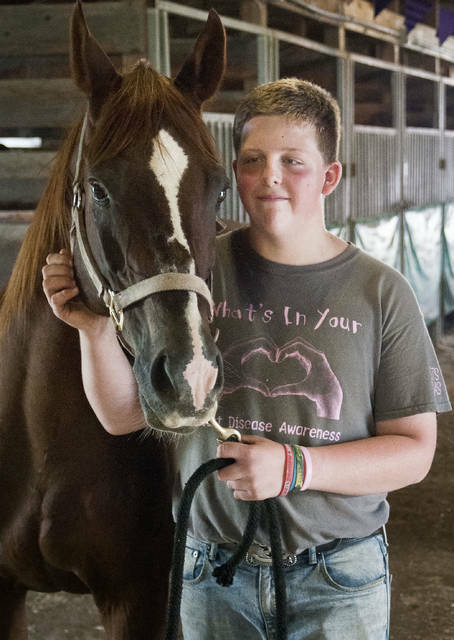 Bryce Smith took his horse, Merada, out to stretch her legs by walking her in the horse barn. This entry was tagged delaware county fair, Junior Fair, live stock. Bookmark the permalink.